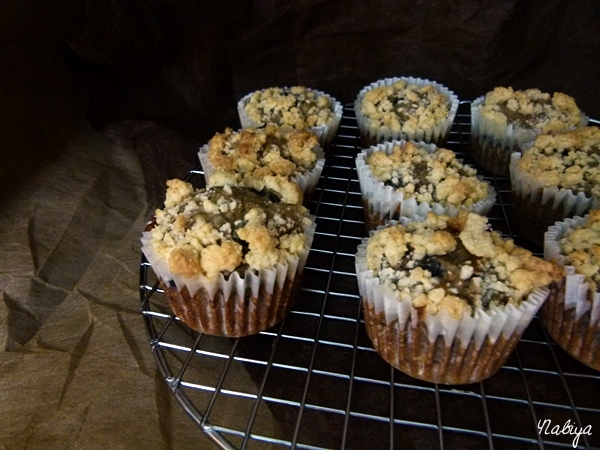 With five productive hours left to my Sunday evening (productive hours meaning those before I have to get ready for bed and work…) I decided to whip up a batch of blueberry muffins for breakfast, and also to bring a few with me to the office for my workmates. However, my mum was craving banana bread too… and so I thought I would just make a carrot banana bread first, then blueberry muffins later. Though having spent the majority of my weekend in the kitchen, I kind of wanted an extra hour to watch some telly before sleep… so halfway through making the banana bread batter, I decided to add in blueberries, bit more flour, and just make a hybrid of the two wishes. I don’t entirely know what I was thinking when I added some of the stuff, but none of the ingredients seemed that bad as standalone ingredients so they couldn’t be too bad put together, right? So this Monday morning, I popped one of the cooled muffins back in the oven for about 5 minutes while I blow-dried my hair and had myself a nice warm muffin on the way to work. Yummy!